French painter. In 1748 he won second place in the Prix de Rome competition and subsequently became a pupil of Carle van Loo at the Ecole Royale des Eleves Protgs, Paris. In 1752 he arrived to complete his artistic education at the Acadmie de France in Rome, where he discovered the art of Raphael and of Domenichino, as well as that of such Baroque masters as Pietro da Cortona, Luca Giordano and Francesco Solimena. He also stayed in Parma and visited Venice, Bologna and Turin. His experiences in Italy confirmed him in his lifelong vocation for large-scale history painting. He entered the Acadmie in 1758. Next year he exhibited at the Salon The Death of the Virgin and the painting was highly acclaimed. 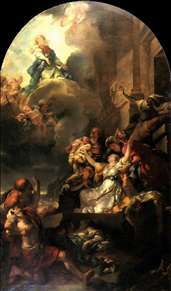 He visited Antwerp and in 1567 painted in Paris The Miracle of the Fervents, a robust hommage to Rubens. He was summoned by Catherine II to Russia in 1791 and he participated in decorative works at her court. He became professor at St Petersburg Academy of Arts. He died in Russia in 1806. See more details about "The Miracle of The Fervent"